Here are a few more shots showing the modernist areas of A Coruna and in particular the city's famous multi level galerias. Some shot are from the famous Marina Avenue area, whilst others are from within the town. Unfortunately there is always one building that seems to have scaffolding up around it and which prevents a really good view showing all of the main marina facing facades. 1. 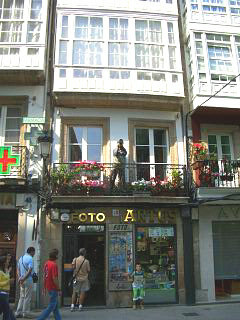 This photo shows a galeria window above a photography shop with a regular balcony beneath it. If you look closely, you can see what appears to be a photographer composing a picture stood on this balcony. In actual fact the man is a life size model and it intrigued many passers by including us! 2. This is just a random picture of some galerias on high with the obligatory Corunan crane in the bacground - We should perhaps have a seperate gallery for all the cranes that we spotted. 3. 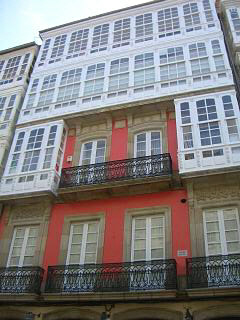 This facade is typical of many in A Coruna. 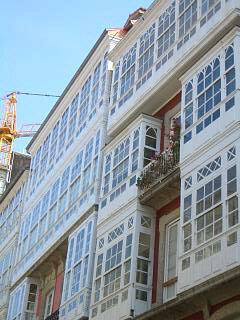 It shows a building on one of the city's main streets that combines regular open balconies and cast iron rails with the white framed galeria style. It also has the addition of some red washed render. 4. 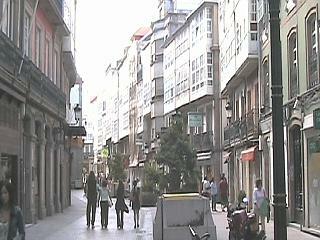 One of the many streets in la Coruna with a smattering of enclosed balconies. You can clearly see how those at 2nd floor level project out beyond the facade beneath. 5. 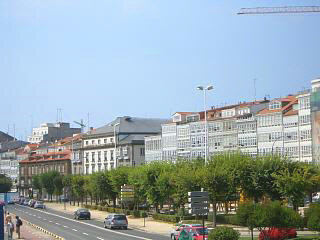 This last picture looks across towards part of the "glass city" at the Marina Avenue which overlooks the bay of A Coruna. Unfortunately, taking the standard panoramic shot of the entire avenue was rendered impossible by the proliferation of cranes and buildings under refurbishment. Back to previous page.